The Upper Austrian aircraft component manufacturer and its Russian partner invest a total of € 55m in Kazan. 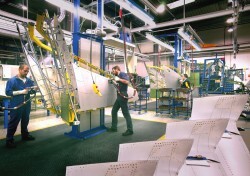 The new plant will supply components for commercial aircraft starting from 2013. FACC AG and Russian Aerocomposit, a unit of Moscow-based United Aircraft Corporation, have agreed to establish a joint venture for the construction of a plant in Kazan, the capital of the Russian Republic of Tatarstan. This article includes a total of 224 words.